The DPG1000 series is a versatile family of industrial pressure/vacuum gauges. All DPG1000 models feature a large (½"/13 mm H) 3½ digit display in a rugged, splashproof extruded aluminum case. A 1/4 -18 NPT 316 stainless steel fitting is standard for the pressure connection. Media compatibility includes any liquids or gases compatible with 316 stainless steel. The DPG1000 features a wide operating temperature range of -20 to 85°C (-4 to 185°F). 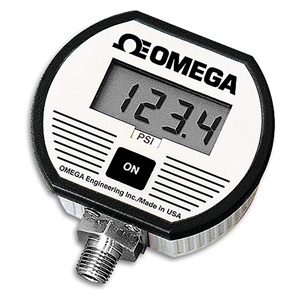 Many different standard pressure/vacuum ranges with both gauge and absolute references are available. The DPG1000 series also features ±0.25% accuracy, 2X overpressure and 4X burst specifications. The DPG1000 is also available with a NEMA 4X rated enclosure. Please see the DPG1100 for complete details, or contact our Pressure department for more information. The DPG1000 is also available with ±0.10% Accuracy. Please see the DPG1001 for complete details, or contact our Pressure department for more information. To order with 10 or 30 minute auto shutoff, add suffix "-F10" (10 min) or "-F30" (30 min), no extra charge. To order with no Auto Shutoff option, add suffix "-NS", no extra charge. To order Backlite display on models DPG1000B or DPG1100B add suffix "BL", add $30.